Electricity is dangerous and can be deadly. Electrical faults from poor workmanship or due negligence can start fires. Never risk your own or others safety if you suspect anything is wrong, call NSE(Wales)LTD and get the problem fixed! circuit breakers star tripping for no obvious reason. switches or plugs feel warm to the touch. you can hear a crackling noise coming from switches or sockets. you can see sparking or just smell something that doesn’t seem right. Being a medium sized company you can rest assured NSE(Wales)LTD always has a Technician ready for any job, enabling us to always be at hand when you need us most. For call outs or emergencies we will always aim to get to potential clients as soon as possible. For same day emergency call outs between 08:00 – 18:00, a callout premium of £50 for the first hour will be charged, followed by are standard rate for every other hour on site. If your electrical fault is not deemed to be an emergency we can arrange a time and date best suited to you for a technician to attend site and rectify your fault. All planned call out work will be charged at are very competitive domestic rate. 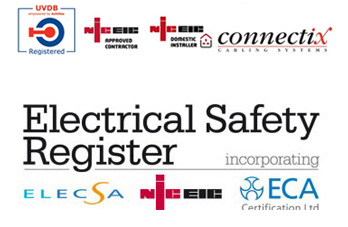 As NICEIC approved contractors you can rest assured all are work is carried out to the highest standard, and upon completion of any minor works you will be issued with a electrical condition report or a minor works certificate.